Air France declared Tuesday that it plans to offer direct flights to Paris from the Minneapolis-St. Paul International Airport next summer. The seasonal service will run from May 21 through September 1 and will be the French provider’s first in the double Cities. The service will include one flight 5 days a week from May 21 through June 16 and one flight daily from June 17 to September 1. The flights will leave the double Cities at 8 p.m. and arrive at the Charles De Gaulle Airport in Paris at 11:25 a.m. the next day. Passengers will fly on a 275-seat airbus, which will have 30 business class seats, 21 premium economy class seats, and 224 economy seats. Round-trip economy tickets for late May are at present selling on airfrance.com for about $2,000. Air France has joined with KLM, Alitalia, and Delta Air Lines to offer linking flights to Twin Cities passengers who want to fly from Paris to other destinations in Europe. The Twin Cities will be the provider's Eleventh location in the United States. 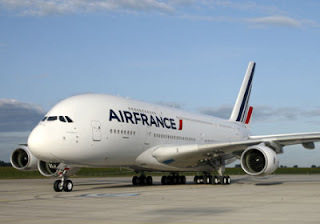 Metropolitan Airports Commission orator Patrick Hogan told Twin Cities Business that Air France hasn’t yet revealed whether it will offer its Twin Cities seasonal service in following years. In addition to offering service from the Twin Cities during summer 2013, Air France plans to also offer new service between Paris and Kuala Lumpur, Malaysia with 3 weekly flights. "With these two new routes, Air France is offering its customers greater choice and extra flight opportunities beside existing services operated by KLM and Delta," Alexandre de Juniac, chairman and CEO of Air France, said in a statement. “With a wider network, we have a clear goal of creating the best flight offering linking the economic centers of North America and South East Asia."